We are happy to welcome Canadian accessory brand, House of Koopslie to CUT & SHOW. House of Koopslie is a range of hand crafted, fashion headbands. The company was recently named as Canadian Gift Association 2016 Small Supplier of the Year by their retailers in recognition of its “excellence, enthusiasm, and dedication to the [giftware] industry”. (CanGift.org). It’s a dedication that has solidified House of Koopslie as a trusted supplier in over 300 stores across Canada, the US and Japan. Please welcome House of Koopslie by visiting their listing here. Full press release below. 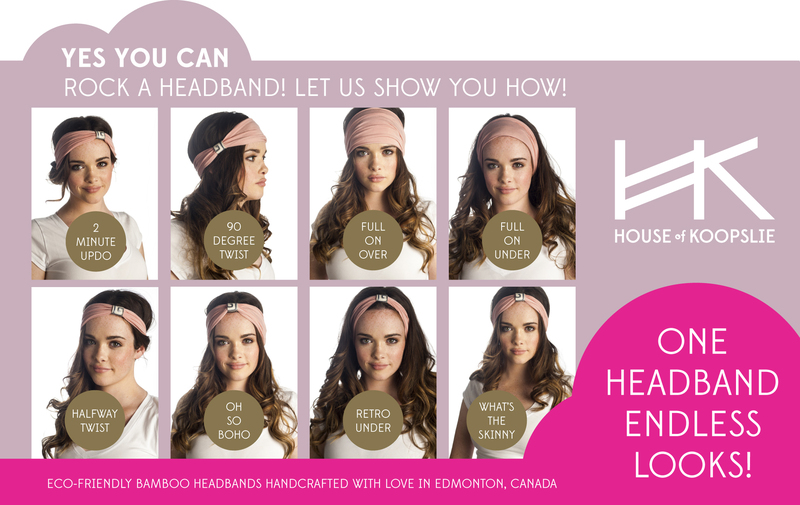 EDMONTON, AB – Handcrafted with love, a House of Koopslie headband is so much more than just a hair accessory. It’s now an award winning headband! The company was recently named as Canadian Gift Association 2016 Small Supplier of the Year by their retailers in recognition of its “excellence, enthusiasm, and dedication to the [giftware] industry”. (CanGift.org). It’s a dedication that has solidified House of Koopslie as a trusted supplier in over 300 stores across Canada, the US and Japan. In addition to their headbands, House of Koopslie had a very successful launch of their brand new product: the House of Koopslie ultra soft bamboo fleece Bum Warmer. Continuing their tradition of producing highly versatile products, the bum warmer also doubles as a skirt, scarf, and hood and is available in two sizes (XS-L and XL-2XLl). The bum warmer is not the only new product in the pipeline. The company is hard at work creating additional new accessories in response to customer requests and feedback. House of Koopslie’s hot selling headbands are available in a wide variety of vibrant colors and patterns, each accentuated with the brand’s trademark leather loop. A House of Koopslie headband is not only stylish but also functional, boasting ten completely different looks. Made with 66% bamboo, 28% cotton, and 6% spandex, the headbands are highly anti-bacterial, moisture wicking and made with Oeko-Tex certified fabrics and threads. House of Koopslie offers retailers full support in successfully marketing and selling their products. They have recently launched a series of how to style headbands videos, books and more! For more information about House of Koopslie, please contact Monika Kupczak Ainslie at monika@houseofkoopslie.com or visit www.houseofkoopslie.com.